New to running? A complete beginner? Follow Sportsister’s training plan and you will be running in your first 5KM race in just ten weeks time. I know running scares the life out of lots of people; I’ve also frequently heard people say it’s not for them – often without having ever done much beyond a few minutes on the treadmill. But one of my main ethos in life however is not to knock something until you’ve tried it, so put the excuses aside and pull on your trainers. Running is great for the soul, the rhythmic pounding of foot hitting pavement combined with an increasing sense of achievement as you clock up the kilometres, is a great feeling. The thousands who take up the sport and stick with it every year is true testament to this. For this reason I’d encourage everyone to give it a try. As with all exercise if you start to feel pain you should stop (note that is real pain, not just feeling a bit knackered!) and consult your doctor before continuing with your training plan. 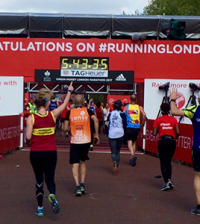 This training plan can be used by anyone and will easily prepare a beginner to bounce victoriously over a 5km finishing line in just 10 weeks. Much though I love testing the latest gear the only thing you really need to get started in running is a decent pair of trainers that are specifically fitted for you. This is a corner that should not be cut. Without proper trainers you will definitely cause yourself injury. Fitting services are offered by many stores such as Run and Become and sheactive. Or hit Google to find your nearest store. Your action plan is enlisted per week. Activity days are Monday, Wednesday, Friday and Sunday. Tuesdays, Thursdays and Saturdays are rest days. If you are totally new to exercise start at Week 1 but if you have already got some experience in running you should feel comfortable starting at Week 3. 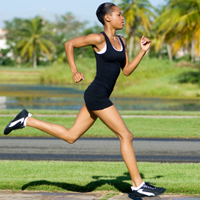 With this running plan you should easily be able to tackle a 5km run. Why not check out your local running club and see if there are any events you can get involved in. These fun runs are great fun and help you really track your achievements as you’ll be issued with a race number and get your official time sent to you shortly after completion of the race. Click here – 5km Training Plan – to download your training plan in an easy to print off and use format. Katie Gormley is Sportsister’s in-house personal trainer. Katie holds a full diploma in personal training from Premier Training, as well as being a qualified sports masseuse and nutritional advisor. She began her personal training career as an intern with Dax Moy (one of the UK’s leading personal trainers) and now works independently in North London. Don’t miss our Kit Bag feature on miCoach – the adidas and Samsung mobile phone that is also your own portable personal trainer! Coming soon on Sportsister – we test the latest short sleeve running tees, bringing you the best buys in the shops right now.